"Good value for money, looks a real treat in the garden"
"Great value for money. Does the job, looks good." 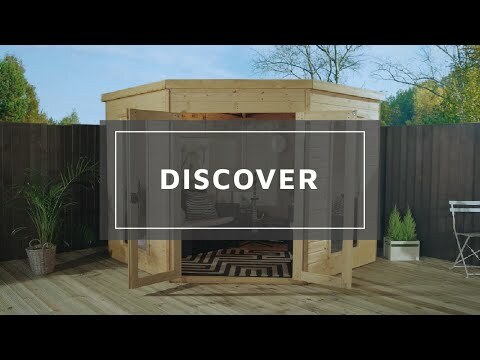 The 9ft x 9ft Waltons Premier Corner Summerhouse features a modern, stylish design, which will instantly become a focal point for your garden. 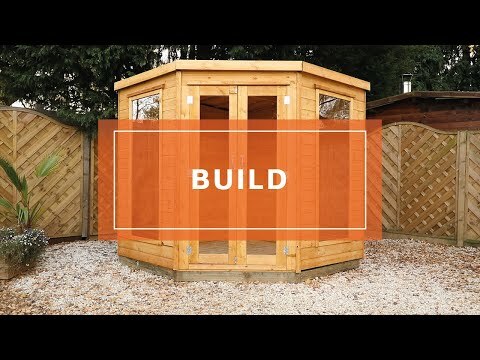 The garden building is made from high quality 12mm shiplap tongue and groove cladding and is supported by 28mm x 28mm framing for an extremely durable build. The roof and floor of the summerhouse are made from interlocking tongue and groove boards which provide additional strength. The spacious interior offers space to relax and admire your garden with your friends and family. The beautiful floor to ceiling glazed frontage and sides fill the summerhouse with natural light for a bright and welcoming space. Wide, glazed double doors open the summerhouse into your garden which is great for entertaining, or can be secured shut with the lock and key when not in use. Heavy duty mineral felt is supplied to help protect the building against weather damage and a ten year anti rot guarantee ensures the summerhouse will last for many years to come. Thank you for your comments, we take all feedback seriously. It is wonderful to know that you are pleased with the quality and value for money. Thank you again for your great feedback. Review:Very prompt delivery and good quality. Thank you for your positive feedback regarding the great quality of your Summerhouse. We hope you enjoy this through the seasons. Review:Thank goodness I had a good builder to put it together. Review:The corner Summer house is ok but the doors should be fitted with a latch as just swing when windy...put one on myself but as the wood is soft its ineffective! I am thrilled to know that you are so pleased with the quality of your summerhouse and I am sure you will have many happy years of use from it. Thank you again for your fantastic review! It is much appreciated! Review:Overall, great value for money! A great finished product, now that it is painted. I am thrilled to know that you are very pleased with your summerhouse and that you found it to be of great value for money. I am sure you will have many happy years of use from it and I thank you again for your positive feedback. It is great that you are happy with the service and quality of your summerhouse. We take your comments on board as we are always looking for ways to make improvements and I thank you again for your feedback. Review:** this questionnaire is another nuisance!!!!!!!!!! Our Reply:Thank you for the feedback. Review:Five stars ~ your systems is so easy from our order to delivery, erection and painted in less than one week. Thank you very much for your great feedback, I hope you enjoy your new Jazz house for many years to come and if you would like to share some images of your new Summerhouse to service@waltons.co.uk that would be excellent. Review:Great value for money. Does the job, looks good. Thank you very much for your great review, it's great to hear that you are really happy with your new Summerhouse. Thank you for your feedback and taking my call earlier. I have updated the details on your account and will await a call back on how you would like to proceed. I am pleased that you are happy overall with the summerhouse and thank you again for your review! Our Reply:I am glad you are satisfied with the value for money of your summerhouse. Thank you again for your honest feedback. Review:Very happy with the look. Very easy to paint before assembling together. Review:Should be an average score! Product ok, but expensive for what it is. Wood thickness could be better, and the thin poly windows-are really disappointing. Our Reply:I am sorry that you think the item price is quite dear in comparison to the quality and I will be sure that the quality team are passed your comments, thank you again.